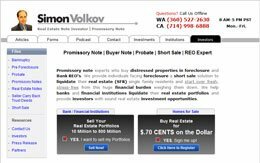 Simon Volkov.com :: International Portfolio :: PRO IT Service S.R.L. - Choose a professional and accessible service for your online image! Simon Volkov from www.simonvolkov.com came to use asking for web site development services, a better content management system integration and a business blog. Simon Volkov possesses over 26 years experience as a successful business owner and industry leader in the manufacturing and distribution of automotive aftermarket products. Because Simon Volkov's Web site layout was based on a table less format and since he wanted to create a blog on his project and to start using Google AdSense as a method to make some money out of his writings, we've agreed to recode by hand his Web site layout in xhtml transitional v1.0 and css v2.0 in table less format. Turning the layout into a table less format allows Google to easily fetch Simon's content and consequently to provide better targeted ads which generate a higher click-through rate and so help Simon make more cash out of this advertising program. As we've agreed to do this change, Simon asked also for some graphical interface revisions here and there as part of this recoding phase. Very important to mention here is also that, as part of this assignment, we've also agreed to validate the source code against the World Wide Web Consortium (W3C) specifications. Last but not least, the scope was to end up with a cross platform compatible Web site which to look the same across any internet browser. Simon was using a Content Management System when he came to us, but as he was mentioning and we've also confirmed, his initial CMS module was extremely limited and wick in publishing features. As Movable Type service provider, I've recommended Simon to add all his Web site pages within Movable Type and to develop his blog and his other section on this very versatile publishing platform. This being said, we've added all his Web pages within Movable Type. In order to be able to operate his various sections, we've had to create a number of movable type sections which to be seemly integrated together at www.simonvolkov.com. In 2006, Simon anticipated the forthcoming decline of the automotive industry and turned his attention toward real estate investing. He attended numerous local and world-class real estate seminars to learn from the masters. After more than a year of continuous study he took his first step into the real world of investing. We've developed this blog section within Movable Type. Simon wanted to keep this blog as simple as possible, so we've limited to integrating a very few movable type extra features such as the social bookmarking networks, email to a friend, printer friendly version, daily updates email subscription and more. The blog (articles) section is sustaining itself via the Google AdSense advertising program which displays targeted advertising on various places around Simon Volkov's Articles Web pages. On the individual article Web page we've experimented displaying ads within the second half of an article and we've noticed that the click through rate is quite high. This wasn't possible in movable type natively and there was no other way to do it than coding a little movable type function. Simon wanted to allow visitors to submit their investing notes and so he asked us to code a number of 5 different Investor Note Forms. This operation was quite complex as Simon had a total of 98 custom fields to code within Movable Type and to integrate within these 5 forms. Some custom fields were used on more than one form, some other were unique for a specific form. We've created these 98 custom fields, coded and integrated the forms within Movable Type. In case a visitor didn't complete all the required fields, a message is displayed and the form won't send the data until the required field(s) is filled out. While initially Simon wanted to have some of these opportunities senders' data not displays on site for everybody, because of the telephone calls he started to get from Investors, he decided to reveal these Investments first name and phone numbers on site inside the Investments section. Simon wanted to have another two sections on site, one for Banks and Institutions and the other one for Investors. Both the Institutions section from http://www.simonvolkov.com/bank-reos.html and the Investors section from http://www.simonvolkov.com/investors/ are registering data in Movable Type which remain private from the public. The interesting part is the Investors section which involves a nice 3 steps registration. Once the registration process is completed, Investors would be advised to subscribe to get Investment updates via email or rss feed. We are hosting Simon Volkov's Web site through our movable type professional hosting service in partnership with Pair Networks, Inc.
Just as it happens with all our other hosting customers, outside of an excellent hosting experience, Simon is also benefiting of a weekly full web site backup which would allow us to restore his Web site in case of any unpredictable events. Anytime a new movable type installation was available we've informed Simon and he authorized the upgrade process at a discounted rate, as he is also hosting his online resource with us. At the moment, Simon is running the latest movable type version (v4.23). I will be limiting to displaying below only two screenshots, the first one for the Simon Volkov main page, and the second one for an individual article page (from the blog section). In case you want to see the full size version, you may like to click on the images below or to go to www.simonvolkov.com and see the Web site in action. The project was executed in phases scheduled every few months.